i love a little color during the summer - my favorite being blue. something about a gorgeous blue evokes summertime with its subtle hint of an ocean landscape. blue is calming, keeps you relaxed and zen during the craziness that comes with summer. but i digress, blue is my favorite and when it comes to accessories it can't be beat. this summer i have been cruising around town in my new Nectar shades. 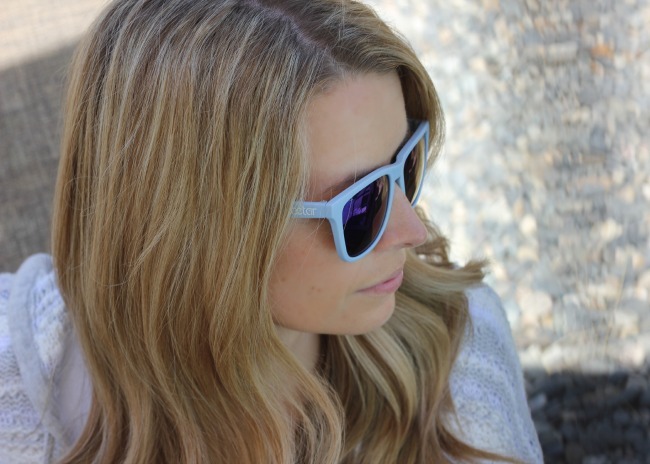 i love the light baby blue frames and the mirrored lenses are a hot touch. these glasses are lightweight which i initially thought might seem a little cheap but after wearing i realize they are amazingly comfortable. no aches on your scull from wearing your glasses too long, you practically forget these are even on. the lenses come polarized which helps relieve the brightness of the sun and they will quickly become a favorite once you give them a try. the real winner about these glasses is the cost. they won't strip your bank account but rather lightly dent it. a hint: use the code LOVENECTAR and you'll receive 10% your purchase. the shoes are courtesy of Painted Bird Footwear which are artisan crafted crochet shoes that are comfortable like a slipper but the hard sole allows you to wear them out of the house (without ending up one the People Of Walmart website - phew!) the shoes come in a variety of colors and a few different styles. i like that they are unique and the shoes you purchase will be yours and individual to you. they come in children's and adult sizes and are a chic option for summer.